Bowman Masonry & Waterproofing addresses this need with the SmartSump™ Crawl Space Sump Pump. Equipped with a cast-iron Zoeller® sump pump, a reliable liner, a sump alarm, and an optional battery backup sump pump, it's exactly what you need to ensure a dry crawl space all the time! Free Crawl Space Sump Pump Estimate! Call us for a free crawl space sump pump quote today! 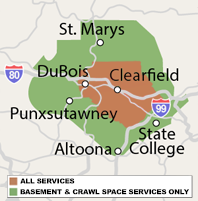 We service Tyrone, Port Matilda, Kersey, Brockway, Ridgway, Pennsylvania Furnace and many nearby areas in Pennsylvania.